The car battery may be one of the most important components of the car as any problem with the battery might leave you stranded on the road. The car battery has two main functions; it helps to start the car when you switch on the ignition and the other function is providing power to electrical systems in the car such as the stereo, lights, radio etc. Since you cannot start your car with a faulty battery, it is highly important to keep it maintained properly. The car battery terminals get corroded over time due to the hydrogen gas that is released from the acid in the battery. In such a case, you’ll be required to remove the battery and clean it thoroughly. 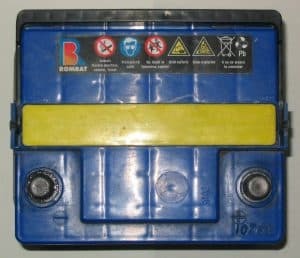 There are many other reasons why you would be required to disconnect the car battery either for maintenance or service. Either way, it is recommended that you know the correct procedure to do it. In this guide, we will discuss how you can correctly disconnect the car battery in a safe way. Before you begin to disconnect the battery, ensure that ignition is turned off and remove the key. If you have an automatic park, check if the car is in ‘Park’ position or it should be in the first gear in case the car has a manual transmission. Since the car battery holds an electric charge and is capable of releasing flammable gas as well, it is a good idea to put on some safety gloves and goggles. Once the ignition has been turned off, open the open by pulling the hood lever or the button which is usually located somewhere below and near the steering wheel. Refer to your car owner’s manual if you can’t find the hood lever. If your car battery is located under the hood. Go towards the front of your car and open the hood. Use the rod to keep the hood standing in its place and then look for the battery’s negative terminal. The terminal may have a black cover on top of it and will have a negative (-) sign indicating that it is the negative terminal. Locate your car battery with help of the owner’s manual. Sometimes it’s located in the trunk or under a seat. You should always remove the negative battery terminal first, to reduce the risk of sparks which can make the car battery to explode. Once the negative terminal has been located, use the wrench to loosen the nut that holds the terminal. Once it is loosened, you can use your hand to remove the nut but make sure you have the safety gloves on. You might face some difficulty in finding the right size socket wrench but once you do, gently turn the turn the screw in counterclockwise direction till it becomes free. Make sure to keep the nut in a safe place. After you have removed the negative terminal, follow the same steps for the positive terminal. Do not let the positive terminal get in contact with any metal part on the car as there is some charge left in the system and in case of contact, the car’s electrical circuit can get disturbed. Once the battery has been disconnected completely, gently lift it up from the tray and carry it with utmost care. You have now completely disconnected and removed the car battery. Batteries are usually heavy especially if you drive a truck or an SUV which has a battery weighing almost 40 pounds. 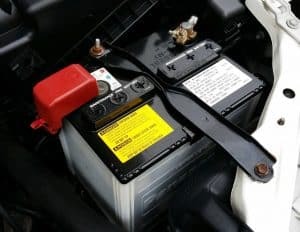 Here are some important safety tips you need to keep in mind before disconnecting the car battery. Batteries store electric charge and might give you a small shock if not handled properly. Before disconnecting the battery, make sure you are not wearing any jewelry such as a ring, watch or a bracelet. If the battery comes in contact with any metal part it can cause an electric shock. Always carry out the battery removal procedure in an outdoor space as the batteries contain acids which release harmful gasses. Working in an open environment will minimize your exposure to any hazardous gas. Make sure the area where you are working is completely dry and covered. Never work in an environment or a place which is damp or has water nearby. Making the cleaner is simple, just mix one tablespoon of baking soda in one cup of water and mix it well. Next, dip the toothbrush into the cleaner and start cleaning the terminals. You might need to apply some force as the dust and grime may be difficult to remove. Scrub the terminals thoroughly till no dust or grime is visible. Once the corrosion is removed, spray water on the terminals and wipe gently with a clean cloth or rag. Once the terminals have been cleaned and dried, apply petroleum jelly on them which will provide some lubrication and prevent any further corrosion. Note: Before you begin cleaning the terminals, inspect the car battery to see if it is leaking, swollen or has any visible damage. If the battery is damaged then cleaning the terminals will be no good and you would still have to purchase a new battery. The car battery is an essential component which helps to start the engine and power all the electrical modules in the car. Cleaning and servicing the car battery terminals is highly recommended and now that you are aware of how to disconnect car battery easily, you will have no difficulty in cleaning your car’s battery terminals.